While doing fieldwork in a small village in Malaysia, I was constantly struck by the breadth of my neighbors’ skills and their casual knowledge of local ecology. One particular anecdote is representative. Growing in the compound of the house in which I lived was a locally famous mango tree. Relatives and acquaintances would visit when the fruit was ripe in the hope of being given a few fruits and, more important, the chance to save and plant the seeds next to their own house. Shortly before my arrival, however, the tree had become infested with large red ants, which destroyed most of the fruit before it could ripen. It seemed nothing could be done short of bagging each fruit. Several times I noticed the elderly head of household, Mat Isa, bringing dried nipah palm fronds to the base of the mango tree and checking them. When I finally got around to asking what he was up to, he explained it to me, albeit reluctantly, as for him this was pretty humdrum stuff compared to our usual gossip. He knew that small black ants, which had a number of colonies at the rear of the compound, were the enemies of large red ants. He also knew that the thin, lancelike leaves of the nipah palm curled into long, tight tubes when they fell from the tree and died. (In fact, the local people used the tubes to roll their cigarettes.) Such tubes would also, he knew, be ideal places for the queens of the black ant colonies to lay their eggs. Over several weeks he placed dried nipah fronds in strategic places until he had masses of black-ant eggs beginning to hatch. He then placed the egg-infested fronds against the mango tree and observed the ensuing week-long Armageddon. Several neighbors, many of them skeptical, and their children followed the fortunes of the ant war closely. Although smaller by half or more, the black ants finally had the weight of numbers to prevail against the red ants and gain possession of the ground at the base of the mango tree. As the black ants were not interested in the mango leaves or fruits while the fruits were still on the tree, the crop was saved. Jack dives into how rapidly the Internet has disrupted the business of selling reproducible works, such as recorded music, investigative reporting, etc. And how important — and exciting — it is build new ways for the people who create these works to be able to make a living doing so. Of course, Jack has some particular ways of doing that in mind — such as subscriptions and subscription-like patronage of artists, such as via Patreon. I certainly agree that many other types of research can be very important and impactful, and often more so than working on data infrastructure, machine learning, market design, etc. for advertising. However, Jack Conte’s talk certainly helped make the case for me that monetization of “content” is something that has been disrupted already but needs some of the best minds to figure out new ways for creators of valuable works to make money. Some of this might be coming up with new arrangements altogether. But it seems like this will continue to occur partially through advertising revenue. Jack highlights how little ad revenue he often saw — even as his videos were getting millions of views. And newspapers’ have been less able to monetize online attention through advertising than they had been able to in print. 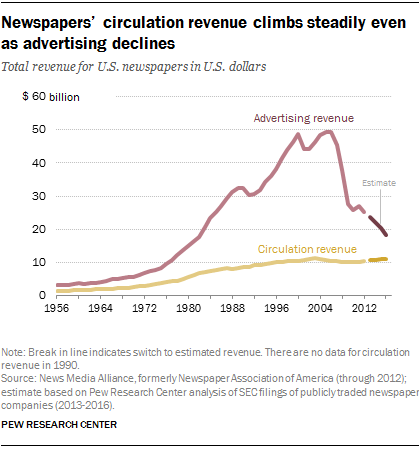 From Pew Research Center’s report “Despite subscription surges for largest U.S. newspapers, circulation and revenue fall for industry overall”. Some of this may reflect that advertising dollars were just really poorly allocated before. But improving this situation will require a mix of work on advertising — certainly beyond just getting people to click on ads — such as providing credible measurement of the effects and ROI of advertising, improving targeting of advertising, and more. Another side of this question is that advertising remains an important part of our culture and force for attitude and behavior change. Certainly looking back on 2016 right now, many people are interested in what effects political advertising had. So maybe it isn’t so bad if at least some of our best minds are working on online advertising. Jane Austen wrote her novels during the Napoleonic wars, but no reader who did not know this already would guess it, for the wars do not appear in her pages, even though a number of the young gentlemen who pass through them undoubtedly took part in them. It is inconceivable that any novelist could write about Britain in the twentieth-century wars in this manner. The monster of twentieth-century total war was not born full-sized. Nevertheless, from 1914 on, wars were unmistakably mass wars. Even in the First World War Britain mobilized 12.5 per cent of its men for the forces, Germany 15.4 per cent, France almost 17 per cent. In the Second World War the percentage of the total active labour force that went into the armed forces was pretty generally in the neighborhood of 20 per cent (Milward, 1979, p. 216). We may note in passing that such a level of mass mobilization, lasting for a matter of years, cannot be maintained except by a modern high-productivity industrialized economy, and – or alternatively – an economy largely in the hands of the non-combatant parts of the population. Traditional agrarian economies cannot usually mobilize so large a proportion of their labour force except seasonally, at least in the temperate zone, for there are times in the agricultural year when all hands are needed (for instance to get in the harvest). Even in industrial societies so great a manpower mobilization puts enormous strains on the labour force, which is why modern mass wars both strengthened the powers of organized labour and produced a revolution in the employment of women outside the household: temporarily in the First World War, permanently in the Second World War. A superior good is something that one purchases more of as income rises. Here it is appealing to, at least metaphorically, see the huge expenditures on industrial armaments as revealing arms as superior goods in this sense. A simple difference-in-means estimator of the average treatment effect (ATE) from a randomized experiment is, being unbiased, a good start, but may often leave a lot of additional precision on the table. Even if you haven’t used covariates (pre-treatment variables observed for your units) in the design of the experiment (e.g., this is often difficult to do in streaming random assignment in Internet experiments; see our paper), you can use them to increase the precision of your estimates in the analysis phase. Here are some simple ways to do that. I’m not including a whole range of more sophisticated/complicated approaches. And, of course, if you don’t have any covariates for the units in your experiments — or they aren’t very predictive of your outcome, this all won’t help you much. Prior to the experiment you could do stratified randomization (i.e. blocking) according to some categorical covariate (making sure that there there are same number of, e.g., each gender, country, paid/free accounts in each treatment). But you can also do something similar after: compute an ATE within each stratum and then combine the strata-level estimates, weighting by the total number of observations in each stratum. For details — and proofs showing this often won’t be much worse than blocking, consult Miratrix, Sekhon & Yu (2013). Often what you most want to adjust for is a single numeric covariate,1 such as a lagged version of your outcome (i.e., your outcome from some convenient period before treatment). You can simply use ordinary least squares regression to adjust for this covariate by regressing your outcome on both a treatment indicator and the covariate. Even better (particularly if treatment and control are different sized by design), you should regress your outcome on: a treatment indicator, the covariate centered such that it has mean zero, and the product of the two.2 Asymptotically (and usually in practice with a reasonably sized experiment), this will increase precision and it is pretty easy to do. For more on this, see Lin (2012). If you have a lot more covariates to adjust for, you may want to use some kind of penalized regression. For example, you could use the Lasso (L1-penalized regression); see Bloniarz et al. (2016).